A few months ago I left my life in London for a new one back up North, and while moving was a bit of a ball ache, it was also a chance to create a new space and put all of my hours spent on Pinterest to good use. I got rid of a load of stuff - the local charity shop did very well that week - in an attempt to streamline my possessions and realise my dream of being uber-cool and minimalist (just don't mention the overflowing wardrobe and piles of shoes...), and while that may not quite be the case, I'm happy with the new space I call home. I live in an old Victorian house which means I get this beauty of a fireplace in my bedroom. It doesn't function anymore and for some reason is full of stones (I'm telling myself it's all part of the charm) but I love it all the same and have added a few bits to make it more style feature, less falling-apart-old-fireplace. 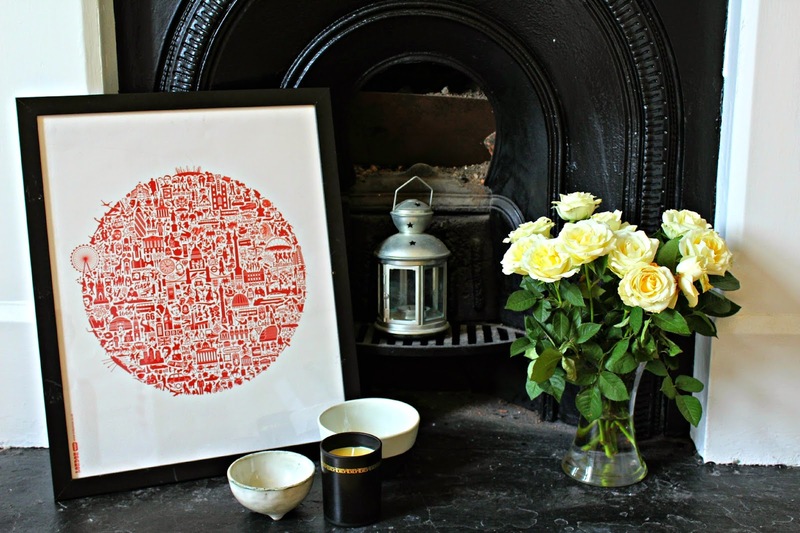 First off, I've got my London print because I love that city and it's nice to bring a piece of it back with me. The frame got a bit scratched in the move (more rustic charm?!) but it'll do for now. Second: evidence of my obsession of bowls. I don't know how many Sophie Conran x Portmeirion bowls I have lying around, purely for decorative purposes. These two are from Broste Copenhagen and Moth, a gorgeous little shop in West Didsbury, Manchester, that sells homeware bits, jewellery and accessories. And finally, candles and fresh white roses because they look pretty and smell nice.